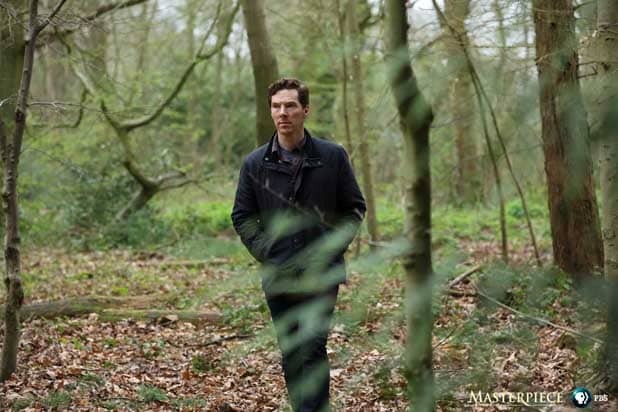 While the sneak peek image simply shows the British actor walking through the woods in England wearing a Barbour jacket and a serious expression, it was enough of a teaser to placate millions of anxious Cumberbitches around the world. Stephen Butchard’s adaptation of Ian McEwan’s award-winning novel also stars Kelly Macdonald (“Boardwalk Empire,” “Trainspotting”), Stephen Campbell Moore (“The History Boys,” “The Go-Between”) and Saskia Reeves (“Wolf Hall,” “Wallander”). Produced by Pinewood Television and SunnyMarch TV for BBC One and co-produced by Masterpiece on PBS, “The Child In Time” follows Stephen Lewis (Cumberbatch), a children’s author, as he struggles to find purpose in his life after his daughter has gone missing. His wife Julie (Macdonald) has left him and his best friends Charles (Campbell Moore) and Thelma (Reeves) have retired to the countryside, battling demons of their own. With tenderness and insight, the film explores the dark territory of a marriage devastated, the loss of childhood, the fluidity of time, grief, hope and acceptance. “A beautiful book, a deeply moving script, and now a cast of first-rate British actors. What a gift,” Masterpiece’s executive producer Rebecca Eaton said in her description of the heart-breaking story. Cumberbatch is also set to return as “Doctor Strange” in Marvel Studios upcoming “Thor: Ragnarok,” which hits theaters in November.